The NEC NP-M402X is 4000-lumen DLP portable projector with powerful 20W speaker, integrated active lens cover and ECO Mode™ technology. 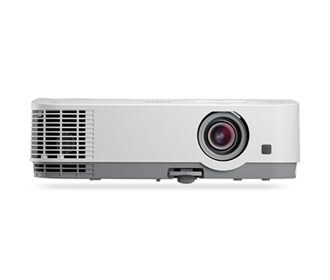 The projector has automatic keystone correction technology, USB viewer and geometric correction. It features cornerstone, advanced AccuBlend, AutoSense and built-in wall color correction. LCD technology provides brilliant, colorful and engaging images Keystone, Cornerstone and Pinchushion ensure the image fills the screen properly from almost any angle. The NEC NP-M402X has Built-in MultiPresenter functionality allows for screen sharing of up to 16 devices simultaneously via a wired or wireless connection (wireless requires NP05LM1). (Win, MAC, Android, iOS) (No Internet access or WAN required). The NEC NP-ME401X has many exciting features for users of all types. You can extend the lifetime of your NEC NP-ME401X with the purchase of a FactoryOutletStore Factory Protection Plan. See the NEC NP-ME401X gallery images above for more product views. The NEC NP-ME401X is sold as a Brand New Unopened Item.